Figure 5-24. 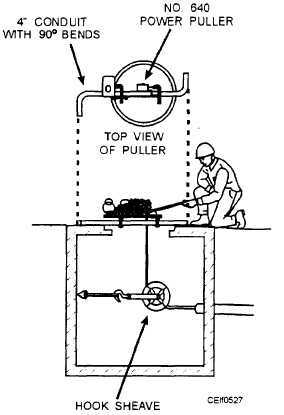 - "Up" pull, using exposed conduit. 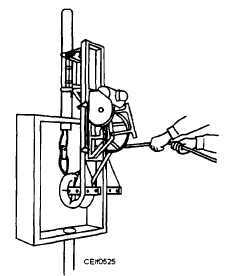 An electrical splice is the joining of two or more electrical conductors by mechanically twisting them together or by using a special splicing device. Since splices can cause electrical problems, they must be made carefully. Splices must be able to withstand any reasonable mechanical strain that might be placed on the connection. They also must allow electricity to pass through as if the wire had never been broken. 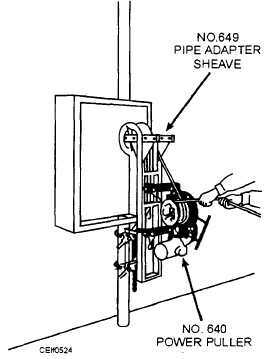 Some of the more common splices are explained below. Figure 5-25. - "Down" pull, using exposed conduit. Figure 5-26. 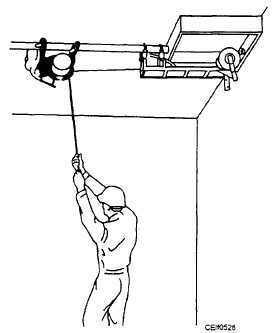 - Pulling in an overhead pull box with the puller mounted independently for extra cable. Figure 5-27. - Setup for ground pull. Because it is simple to make, the pigtail splice is probably the most commonly used electrical splice.